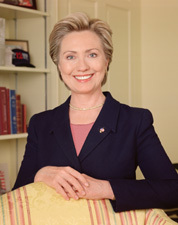 CLINTON, Hillary Rodham, (wife of President William Jefferson Clinton), a Senator from New York; born on October 26, 1947, in Chicago, Illinois; attended public school in Park Ridge, Illinois; graduated Wellesley College, BA 1969; graduated Yale Law School, JD 1973; attorney; counsel, impeachment inquiry staff, House Judiciary Committee 1974; First Lady of Arkansas 1979-1981, 1983-1993; First Lady of the United States 1993-2001; elected as a Democrat to the United States Senate in 2000; reelected in 2006, and served from January 3, 2001, until her resignation on January 21, 2009, to accept a Cabinet position; an unsuccessful candidate for Democratic nomination for president in 2008; Secretary of State in the Cabinet of President Barack Obama, 2009-2013; was an unsuccessful Democratic nominee for President of the United States in 2016. Clinton, Hillary Rodham. Living History. New York: Simon & Schuster, 2003; Clinton, Hillary Rodham. Hard Choices. New York: Simon & Schuster, 2014.